The critically acclaimed and bestselling role-playing-shooter hybrid, Borderlands 2, is now available for the PS Vita system! Stuffed with 6 Add On Packs, Borderlands 2 on PS Vita delivers hours upon hours of signature addictive Borderlands nonstop collaborative loot-shoot gameplay. Borderlands 2 is the sequel to the critically acclaimed four-player cooperative shooter-looter that combined intense first-person mayhem with role-playing gameplay. 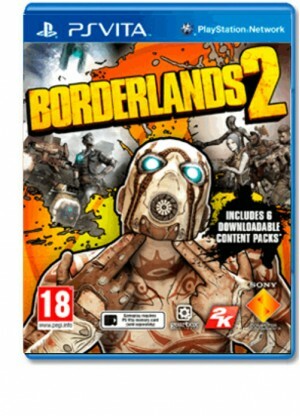 The second game in the series, Borderlands 2 raises the action of the original game with an even larger and more detailed world to explore, an updated gun system, a new cast of characters and character classes, and integration of storyline with action.